Palm Coast City Manager Jim Landon is digging his heels against Flagler County Election Supervisor Kimberle Weeks’ “demand” that the city turn over its larger room at the Palm Coast Community Center, or her request that the city not charge the supervisor’s office for use of the center. Hearing the issue Tuesday, the city council is letting Landon proceed on his terms: the council will not cede the larger room, and it will let the administration charge the supervisor for any staff hours outside the normal work day. “Are you looking for council input on this?” Mayor Jon Netts asked Landon. “You can provide input but you’re talking about managing our community center,” Landon replied, making it clear he was not keen on the council interfering with his administrative decisions. The style is overwrought, as McDonald can be. He criticizes the council, and particularly Landon, at almost every council meeting, often making either baseless or poorly sourced accusations. But there is nothing inaccurate or “misleading” about his note: if the city will let the supervisor use the community center for the 13 days of early voting in the 2014 primary and general elections, it will charge the supervisor’s office. It would do so even though the county’s public library on Belle Terre and Palm Coast Parkway, where early voting has always been held, has never charged the supervisor’s office for use of a room there. Palm Coast has never charged the supervisor for use of the community center on Election Day itself, nor does it propose to, but that’s not the issue either McDonald or the supervisor is raising. A new early voting location is. McDonald’s email is not the issue, either, though Landon made it so; Weeks has been trading emails with the city clerk and the recreation director over the matter. But McDonald’s email doesn’t tell the whole story, and could be interpreted as misleading because of what he omits: Weeks’ own intransigence about the room she wants to use. The larger room at the community center is set up for council meetings with the city’s television transmission equipment. It’s also roomy, for a relatively large audience. And it’s used by innumerable other groups. The council could theoretically hold its meetings elsewhere for the duration of the early voting period, but it could not televise the meetings. Netts doesn’t want that disruption. The community center has another room available. Weeks has used that smaller room in the past on Election Day, though the larger room has also been used previously (as was the case with Palm Coast’s last municipal election and the recent school board tax referendum). Why not reserve the smaller room? Weeks can be combative and aggravatingly persistent, as was the case in the early part of her first term. But she has been much less aggressive and more accommodating in recent years. Landon was inaccurate—and himself misleading—when he claimed, in his memo to council members, that Weeks had found his recreation director’s response “unacceptable.” Weeks had merely questioned who she should direct her inquiries to, because she’d written Virginia nSmith, the city clerk, and received a response from Luanne Santangelo, the parks director. There was no mention of an “unacceptable” proposal, though she made her preferences clear without as yet ruling out a different arrangement. Weeks is set to appear before the city council on Sept. 3. Landon was adamant against letting the supervisor use a room without paying, though theamount in question is a matter of a few hundred dollars. “If you do that, only Palm Coast residents are going to pay for that election cost, because that’s the only reason they’d be there is for the election,” Landon said. Actually, at the moment, given that the county library does not charge for early voting days, and that mostly Palm Coast residents vote there (since Flagler Beach residents travel straight across State Road 100 to the Bunnell early voting location), the county is subsidizing Palm Coast voters, free of charge. So is the supervisor’s office and its staff, which remains open late on early voting days, and where some Palm Coast voters go to vote early. If the supervisor were to bill all jurisdictions for her early voting costs, she would actually be splitting only Palm Coast’s facilities cost. Two council seats are up for election in 2014. The city moved its elections to coincide with even-year cycles, and other elections, in order to save money. It would have been spending far more money had it held on to odd-year cycles, as it would have essentially had to continue paying for its own, exclusive elections. Council members were mostly muted during the discussion. Jason DeLorenzo alone spoke against charging the supervisor, though Netts at least appeared willing to dispense with the fee as well. Both were clearly in support of more early voting locations, but they stopped short of giving Landon any direction different than he was giving the council. Talk about a snit! Mr. Landon, “esteeeeeeeeemeemed” council members, do you realize that we already PAY for this building in our taxes? Why should we have to pay again to vote? I’ll bet that Mr. McDonald pays his taxes, too. Let me join him in being a “thorn in the side of the council” on this one. We pay YOU to work for US. What’s wrong with this picture? Landon wants to charge Weeks and dictate to her what room she will get. Why is Landon now wanting to charge Weeks when she hasn’t been charged before? Sounds to me Landon is the bully, and the Council needs to remind Landon that he works for them. What should be done is what the people want. I hope the meeting room is packed on September 3rd at 6:30 to show support for Weeks to allow her to best serve us voters. Why we the tax payers should pay twice for the right to use in government business as an government election is, our community center in the proper sized room as the one mentioned to be allowed is too small. Since when Mr. Landon is an expert SOE also, defining how much room we, the voters, need in a precint? Collaborate and allow at no charge SOE Weeks to use the large room on the community center for the voters. Many elderly reside in the east side of I95 and why do they have to travel west in PC Parkallie for the early voting? Don’t start pointing fingers and false accusations against a good and honest constitutional official SOE just nickeling and diming, because looks pathetic. What about we stop tax subsidizing by thousands and thousands Kemper sports instead. Note to Landon: You’re history dude. Pack your sh**. Also the rest of them ! I would pay to vote, and I can tell you who i’m NOT voting for, time to clean out the crooks in this county…. Voting has to get paid for, and good for Mr. Landon in insisting that it does when using City property. “City Property” belongs to the tax payers!!!!!!!!!!!! I’d be embarrassed to tell anyone that I live in Palm Coast for three reasons. 1.The City doesn’t want to cooperate with the local County and Cities. Example A: Palm Coast wouldn’t contribute to restoration of Flagler Pier. Example B: Palm Coast won’t allow free use of a Community Center for early voting. 2. Red Light Cameras that drive away business and potential Home Buyers or Renters. 3. Being bullied by Code Enforcement and the Permit Office. Palm Coast is out of control! These people sitting in these positions need to realize who put them there!! Voting is a right given to every citizen and it is the communities responsibility to make accessible for every voter. I work the elections and I can tell you this, the small room is workable but inconvenient for some. The larger room is much more inviting and accessible. Many voters commented on how nice it was. As a poll worker it was great to not be crowded!! But that is not the issue. Kimberlee really goes out on a limb to make sure everyone who wants to vote has that opportunity. The library is great as is the government building. But many complain about the line at the library and the driving distance! Why not make it easier for people to vote? Charge? Just proves to me that all these board members think about is money!!! I thought they were elected and given these positions to work the betterment of the community and its citizens. Palm Coast is just ridiculous when it comes to charging for every little thing!! Red light cameras with shortened yellow light time, what a scam. These people need to get their heads out of their hinneys! DOES JIM LANDON REALLY EXHIBIT THE HEART OF A CIVIL SERVANT TO YOU? Real Estate Consultant, Michael Barr, made a good point when he said you have to learn when and how to “grovel” with the city. He should know, he’s done business with them. But grovel? Really? Are we in Tehran? Jim Landon has gotten away with so much abuse that he believes that if you don’t kiss his ring just the right way, he’ll create any issue he wants just to stick it to you and everyone else you know. His ego has been disturbed so he’s ignoring his fiduciary responsibilities and trying to exercise abusive power and control over Weeks and voters. He’s an immature child. It’s pay-back. Can’t someone just fire the man finally? The town manager is one of the short comings of the style of government in Palm Coast. The citizens would be better served with a strong mayor government. One, who is elected by the people, serves two years and is paid a reasonable salary. The town manager is selected by the town council. The town manager’s salary is determined by the town council. The town manager serves at the pleasure of the town council. The town manager answers only to the town council. The concept of being accountable to the citizens is not a factor in this equation. Whoever voted for this style of government got what they voted for. Do you happen to know how many signed petitions it takes to initiate a vote for changing back to a mayor government? The Supervisor’s office maintains voting records for each election. One report, known as the Statement of Votes Cast chronicles the total votes cast per election and further categorizes the votes per precinct and method of voting i.e., Polling, Absentee, Un-scanned, Provisional, and Early Voting. The SOE also records Voter Registration statistics each month and provides a total per precinct. Early Voting stats are also maintained. Using all of these reports, it is quite easy to discern and budget for an approximate Early Voting turnout. SOE Weeks states the PC Community center is central to “our largest polling places”. 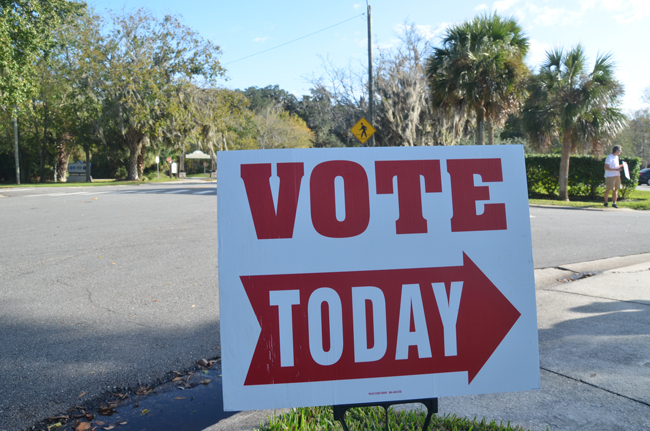 According to the Voter Registration Count as of 7/31/2013, the top ten populated precincts are: VFW Post 8696, Shepherd of the Coast Lutheran Church, First Baptist Church of Bunnell, Palm Coast Community Center, Belle Terre Elementary, Flagler County Public Library, Adult Education Center (A1A), Flagler County Schools Bldg. (Hwy 100), Flagler Beach City Community Room, and Buddy Taylor Middle. Of these, the VFW, the Community Center, and the Adult Education Center are in close proximity to the PC Community Center with regards to Early Voting. Other precincts that might use the center for Early Voting are Grand Haven, and Old Kings Elementary. The others are west of I-95 and may be closer in proximity to the Library or SOE’s office for Early Voting purposes. 22 Early Voting Staff, 11 days of operation, 9 hours a day, $9.00 per hour per staff. A total of $19,602 has been allocated to accommodate an Early Voting turnout between 2500 and 3200 voters. That’s a per vote cost of $6.12 to $7.84. One Early Voting staff member will realize $891 for the 11 day period and will be paid for attending poll worker training class. Presuming two sites are staffed at 7 each and one with 8, the SOE will pay $6237.00 for the staffing at one site. A precinct clerk will receive, on average, $175.00 for Election Day. An assistant clerk receives $160.00; a book inspector, ballot box person, and deputy will each receive almost $130.00. The SOE paid a total of $18,947.42 for poll workers on Election Day for the June 7th School Board Referendum Election. Churches used as polling locations, charge a fee of $100.00 for Election Day. If one were to be used as an Early Voting site, the fee would be $1100.00 (11 days of Early Voting). The City seeks a fee of $507.43 ($427.50 + 7% tax, +$50.00 deposit). That is less than $50.00 per day. Given the re-directing of activities that are normally scheduled for the Community Center for an 11 day period, and the numbers for turnout for Early Voting, the smaller room that has been used in the past without any fee, would make more sense. Also, according to the statues, “the sites must be geographically located so as to provide all voters in the county an equal opportunity to cast a ballot, insofar as is practicable”. Designating two Early Voting sites in Palm Coast will most certainly make voting more convenient for a select area; but folks along the east coast and those in the western part of the county will still drive quite a distance to take advantage of Early Voting. I have lived in Florida all of my life. I well remember the days before Early Voting and the easing of the use of an absentee ballot. I stood in long lines to vote which often meant leaving for work an hour earlier in order to get through the line. I also remember polling locations were few and far between. The “right to vote” is a topic for many discussions. The U.S. Constitution does not specifically enshrine a person’s “right to vote”. It has been amended in order to demonstrate that people cannot be denied the vote. The qualification method is left to the States. Nowhere is it required that voting be made so convenient that taxpayers are asked to pay for Early Voting sites not geographically beneficial to all voters and unnecessary by virtue of the historic numbers. Even if the fee is waived, make no mistake, the taxpayers will pay for this added unnecessary site. Time for a beer summit. Herr landon know he only has to keep 3 members of the council happy to keep his job. He doesn’t give a damn about the residents of Palm Coast or what they think of him. Time for this man to GO. The only way to stop the madness is through your right to vote, get out there and vote these egotistical flim flammers out of office, it is up to you the voter to send the message!!!!! Because Landon isn’t elected he must feel he isn’t accountable to the tax payers. The Supervisor of Elections is in charge to know what is needed to conduct elections and the city should show respect and support her.